I was memorized with this collection! Various hues of candy colours, the use of embellishment and just the way it's all fitted. A modern day fairytale perfection! I've said this on twitter but I'll say it again, I have nowhere to wear any of these stunning dresses but hey, who cares if I had myself any of these bad boys I'd wear it to the supermarket, coffee shops, work, heck I'll even sleep in it. Here we go then, my favourite from each shade... Take it away Elie Saab. I have ADORED Elie Saab for seasons now, and I'm so glad to still see that he is creating such fantastical dresses. They take us out of our everyday lives and into a world of princesses. He makes me feel 5 years old again ;). Thank you so much! I'm glad you've enjoyed my blog, hopefully others are enjoying it too. I'm following your blog! 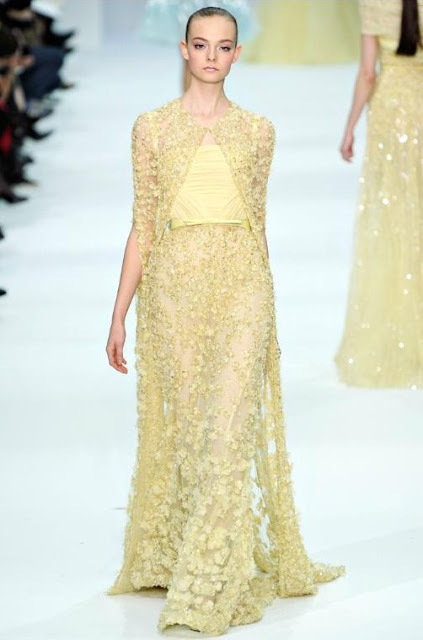 Love Elie Saab's creations... his dresses are so whimsical and feminine. I would kill to own just one! This is my favorite spring collection by far. I absolutely love the colors. I love your blog! Would you like to follow each other? This collection is beautiful, so pretty! Elie Saab - God created a Genius ! This guys is the most loved man , alive ! All women love him ! The First Two Are Absolutely Fab....thanks for keeping us up to date on fashion Matters across the globe!! !